Brad Pitt as Robert “Rusty” Ryan in Ocean’s Thirteen (2007), matching his shoes to his luggage rather than to his belt. With Memorial Day in our wake, it’s now sartorially safe to whip out the white suitings from the back of your closet when dressing to impress this summer. One movie that most influenced my own summer style during my formative years was Ocean’s Thirteen, a celebration of sprezzatura from Al Pacino’s bold business wear to the vivid outfits sported by Bernie Mac. For me, it was Rusty Ryan’s flashy suits and sport jackets that lingered in my mind when eyeing new summer threads. It takes the flashy confidence of a Brad Pitt type to wear (and pull off) the literally flashy suit worn for his pre-dawn strut across the tarmac as Rusty boards a private plane chartered by Danny Ocean (George Clooney) for the team’s next job, accented by the cool “Not Their Fight” composed for the film’s awesome soundtrack by David Holmes. 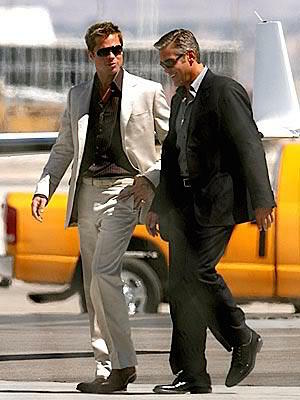 Costume designer Louise Frogley told the Daily Mail in May 2007, just before the release of Ocean’s Thirteen, that “Brad was sure that this time his style for Rusty Ryan had to be cleaner, much more simple – ‘less bling and less shiny-suity,’ as he put it,” though this seems at direct odds with his first on-screen suit, a very shiny white silver suit with a satin finish that gleams brilliantly under the dimly-lit airstrip at night and the Las Vegas morning sun. Perhaps it’s most indicative that Rusty only wears this suit at the film’s outset, a spiritual success to his shiny gray silk suit in Ocean’s Twelve and only worn before learning the dire situation of his friend Reuben’s health. The suit jacket is single-breasted with notch lapels that roll to the top of three gold shank buttons, all worn open. High on each of the jacket’s flared sleeve-ends are two smaller gold “kissing” buttons which match the three down the front and help differentiate this suit from a similar silver suit that gets brief screen time later in the movie. Coffee in hand, Rusty settles in for a brief flight. The jacket has a welted breast pocket and straight flapped hip pockets plus a flapped ticket pocket on the right side. The shoulders are padded with roped sleeveheads, and the back has a single vent. Rusty’s flat front trousers have a lower-than-traditional rise that reflects his casual nature. Straight pockets are cut along each side seam, and the slightly flared bottoms are finished with plain hems. His ivory leather belt, likely Prada, provides minimal contrast against his suiting, and the squared single-prong gold buckle coordinates with the gold buttons on the front and cuffs of his jacket. Rusty wears a black dress shirt with a white pinstripe that coordinates with his suit and softens the otherwise stark contrast between the dark shirt and the light, shiny suit. The shirt’s large, tall point collar is worn open as is the next button down the shirt’s plain front. Rusty later wears this same shirt during the film’s climactic con with a charcoal silk suit, more appropriate for a night out in a casino. If you blew all your money on the suit but you’re still looking for the perfect shirt to channel Rusty’s outfit, this affordable poly/cotton “Onyx Pinstripe Shirt” from Averill’s Sharper Uniforms nails the general look with the pattern and breast pocket… if not the distinctive details like the single cuffs. Rusty wears the single cuffs unfastened (despite having holes for links), revealing the yellow gold Rolex GMT Master II strapped to his right wrist on a gold Oyster link bracelet. Rusty consults with the team after landing in Vegas. Rusty’s Rolex watch isn’t his only gold accessory as he also wears two rings in addition to the gold pendant on a thin gold necklace around his neck. He wears a thick gold ring on the third finger of his right hand and a smaller gold ring on his left pinky. Rusty’s shiner gleams from the third finger of his right hand. Brad Pitt is a noted fan of the Oliver Peoples eyewear brand and, in fact, wears a pair of their “Strummer” model aviators in Ocean’s Thirteen. However, the fashion-forward shades he is briefly seen wearing after descending on the Las Vegas tarmac more resemble the Ray-Ban RB 3291 sunglasses that Pitt was spotted wearing on set. Identified by SunglasssesID.com, Pitt’s Ray-Bans are silver-framed with purple-gray gradient lenses (color code 003/8G). You can still pick up a pair at EyewearOrders.com. Rusty struts off the plane, immune to the blinding qualities of his suit in the sunlight thanks to his protective shades. Rusty foregoes matching his shoes to his belt and wears a pair of cognac-colored leather oxfords, likely the same pair that he wears with his other outfits in the film. Rusty delivers a fresh and flashy take on the post-Memorial Day white suit with this ensemble anchored by a satin silver bespoke suit and striped black shirt.